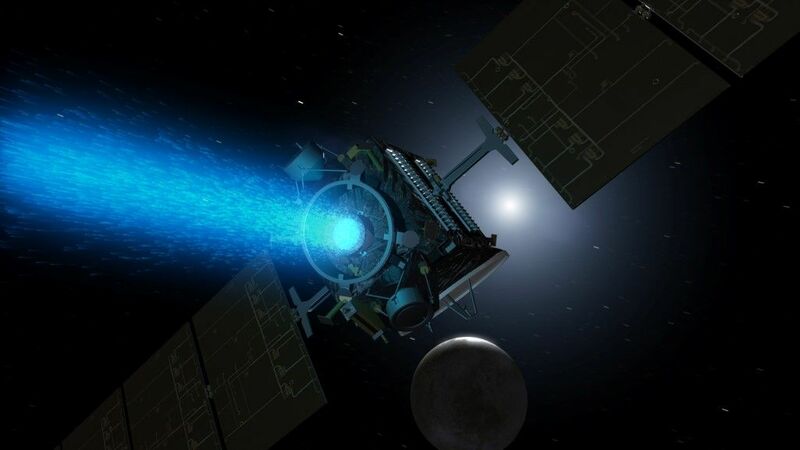 NASA’s Dawn spacecraft added another trophy today to the conquest of space as it went into orbit around Ceres. According to the space agency, the unmanned probe arrived at about 4:39 am PST and is currently circling the dwarf planet at an altitude of about 38,000 miles (61,000 km) – making it not only the first spacecraft to reach a dwarf planet, but also the first to orbit two extraterrestrial bodies. The signal confirming Dawn’s orbit was received by NASA’s Deep Space Network at 5:36 am PST. At the moment, Dawn and Ceres are 3.33 AU (310 million miles, 498 million km) from Earth and a radio signal takes 55 minutes to make the round trip. Despite being such an historic occasion, this morning’s events were described by Marc Rayman, Chief Engineer and Mission Director at the Jet Propulsion Laboratory (JPL) in Pasadena, California as almost routine; with little fanfare and even the timing of the signal as simply being part of the daily schedule. In contrast, when Dawn reached the asteroid Vesta in 2011, it was 25 hours before it transmitted the news home. The reason for this rather casual reception is Dawn’s ion propulsion. Unlike other spacecraft, Dawn uses an electric engine instead of chemical rockets. This engine pushes out a stream of charged xenon ions that is 10 times more efficient than rockets. True, the thrust is less than the weight of a sheet of paper, but the engine can fire for months or even years on end instead of a chemical engine’s minutes. The upshot of all this is that Dawn’s approach to Ceres was a long, leisurely one and its going into orbit was also about as dramatic as watching as bit of driftwood float in with the tide. Since Dawn’s relative speed is so low and Ceres’ gravity is so small, Dawn’s arrival lacked the drama of other space missions. Unlike the Curiosity landing, which NASA characterized as “seven minutes of terror,” or Apollo 8, where mission control spent nail-biting minutes waiting for it to appear from behind the Moon after firing its engines, a failure to achieve orbit by Dawn would have involved little more than a long, slow course correction and trying again. Dawn was launched on September 27, 2007. After making a flyby of Mars on February 4, 2009 in a slingshot maneuver, it went into orbit around the protoplanet Vesta on July 16, 2011, where it carried out a 14-month survey of its surface. Its ion thruster then sent it on a three and a half year passage to Ceres. NASA says that Dawn will remain permanently in orbit around Ceres. Over the coming weeks and months, it will spiral in closer to the dwarf planet, taking more detailed images and seeking information about the origin of the bright spots on the Cerean surface, the structure of the asteroid, and whether it is still geologically active. The animation below shows Dawn’s arrival at Ceres orbit.